We introduced ourselves to the Treasure Valley in 2015 with Icebreaker, returned in 2016 with Reframing Radical, followed that in 2016 with Expose. Explore. Expand. and last hosted in 2018 with Uncharted Territory. We look forward to returning our red dot to the stage on April 20 with our fifth annual event! 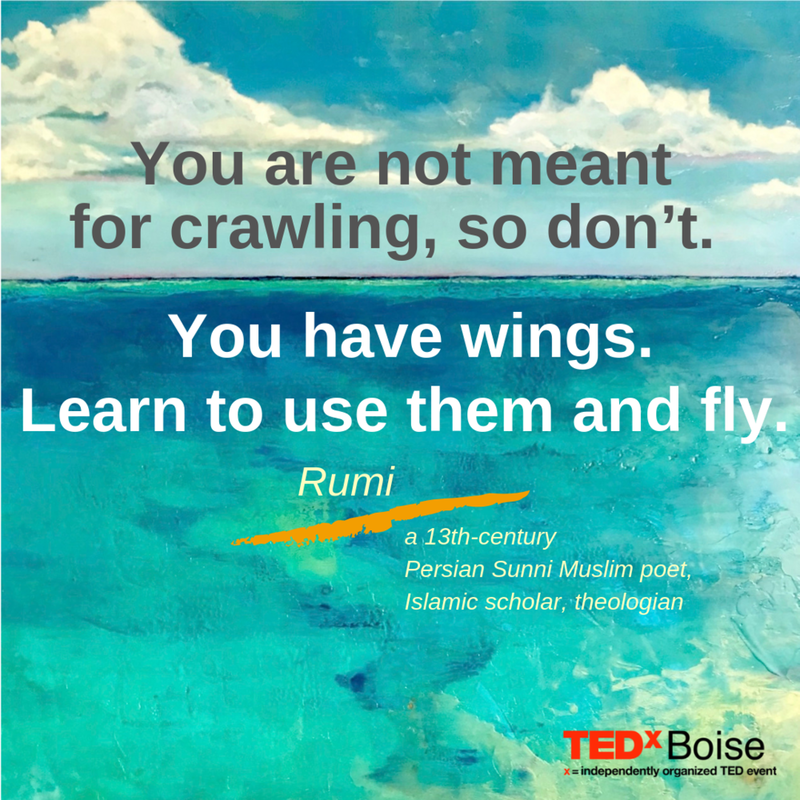 We took inspiration from the great poet Rumi, who instructed, “You are not meant for crawling, so don’t. You have wings. Learn to use them and fly.” This year’s TEDxBoise lineup includes people who are choosing to do just that, reaching both within and higher to share unique visions with our community, and encouraging us to all Take Flight. And there’s our theme for 2019! So scroll around our website to enjoy the new graphics, and remember: when we choose to get ourselves off the ground, we discover the view is entirely different in the sky! Take a look up and share your photos and videos with us on social with our favorite hashtag: #tedxboise. Please also visit this page to learn more about each speaker and his/her topic and plan to join us in the Spring. Tickets are on sale now and we've made it super easy to attend. Click here to purchase yours and, as always, plan on joining us at the after party—a great opportunity to talk with each of our speakers in person!